I have a friend in real estate, and when the mortgage bubble burst, she tried to act like nothing was wrong. We would go shopping, and even though you could tell she was worried, she kept spending money. I think one importtant thing is that you should really set up a pretty conservative budget for yourself if you think your job might be in trouble. Your friends don't care if you have money or not, they care about you. Great idea. Not only is it important to cut costs when you're worried about your income, but it's something the whole family can help with. That makes everyone feel more empowered than being told nothing is wrong. I really like your last line about friends caring more about you than how much money you make -- a good thought for all of us. I think it's also important to think different in a situation like this. 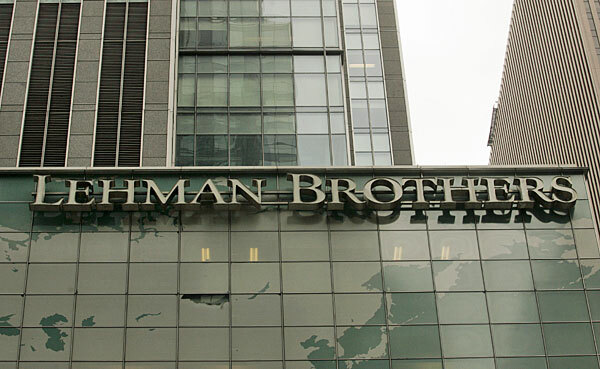 Everyone from Lehman Bros. is looking for a job now and they all have similar bakcgrounds. It may be time to think of using your skills in another industry so as to give yourself more opportunities. Excellent point. To expand on that thought, think more about the skills you used than your job title. And, how those skills can transfer to different kinds of companies. Were you good at team-building, strategizing, developing new products, customer service, etc? Those are skills that any company can use -- including non-profits. You're absolutely right. Single parents are in an even more dire situation, and SPEED is the most important thing. They've got to get a job that's a good fit for them, as soon as possible. You're also right about networking often, and keeping those contacts within the working world. Pulling the covers over your head may sound appealing, but as you said, you'll pay a big price for doing so. First watch 'Office Space' & just to laugh at the bad stuff in cubical life. I know this can works for junior people or recent grads, but would this be too slow for people with kids & mortgages? I absolutely agree that going back to school is a good option if that's what you need to do to position yourself better in the marketplace. You make terrific points about the advantages. I do know parents who have done just that, while the other spouse supported the household. That may be much tougher to do if you are a single parent. However, there are temp jobs or even part-time jobs that you could do in order to return to school -- employers understand that parents must do whatever they can in order to support their children. I would suggest, also, that if parents find themselves in this position that they immediately assess their finances and meet with a community credit counselor to get a handle on how they can survive this situation until a fulltime position comes along. By the way, love your suggestion on remembering to laugh and find ways to still enjoy life. A positive attitude is critical. Full-time studying is a good option with quite a bit of commitment; Although something lighter, like courses with evening classes once a week in project management, excel, presentations ... It might be easier & getting alot of benefit.